Ideally located in the fashionable Brisbane Bayside suburb of Manly, famous for its Yachting and seaside restaurants, clubs, markets and many other attractions the house provides the perfect holiday accommodation venue for couples or families seeking an enjoyable and relaxing stay. The stand-alone self-catering house is the epitome of a Queensland indoor-outdoor lifestyle with open plan living and fully equipped modern kitchen adjoining a private rear deck and a garden for the children to play in. With two sizable bedrooms there are three beds (one queen, one double and one single). The house comfortably accommodates a single person through to a family of five. The house and landscaped garden are always immaculately maintained ensuring you will feel relaxed from the moment you arrive. There’s a high standard of quality furnishings and appliances throughout the entire house. Fully equipped with a plentiful supply of the ‘essentials’ as well as fresh linen and towels you need to pack only your clothes, beach towels and personal items. The house has a wonderful ambiance due to the welcoming spacious design and standard of cleanliness. ‘Simple yet Perfect’. Open plan lounge-dining area which includes a 50 inch HD TV, blue-ray DVD player and IPod dock with blue-tooth connection. Modular couch, dining table and chairs to comfortably seat four. The galley kitchen includes European appliances such as a 5 burner gas cook top, electric oven, dishwasher, microwave oven and a full size fridge. All crockery and cutlery is supplied. Gas barbeque and outdoor dining for six situated on a covered deck surrounded by sub-tropical plants and lush green lawn. The bathroom has a walk-in shower with a separate deep soaker bath and polished porcelain tiling. All towels are supplied. All bedroom linen is supplied. Each bedroom has a built-in wardrobe including a chest of 5 drawers. The laundry includes a family sized front loading washing machine and clothes dryer. Air conditioning and ceiling fans keep the house cool in summer as well as a North Easterly Aspect attracting natural light and sea breezes. 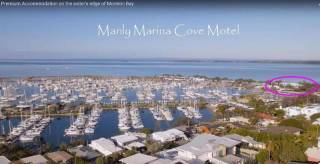 The location of the Corporate Beach House is very convenient for travellers wanting to enjoy the local Manly attractions as well as visit Brisbane City and South East Queensland. Its peaceful residential street is within a stone’s throw of the Manly Esplanade and waterfront. Manly village is a simple 5 minute walk along the esplanade and Brisbane City is 30 minutes by car or 35 minutes by train. Via the nearby Gateway Motorway the Gold Coast and Sunshine Coast surf beaches are a 1 hour drive and Brisbane’s airport is a very easy 20 minute drive. Manly is a very popular holiday destination and The Corporate Beach House one of the most favoured accommodation homes. Thus unfortunately the house is often booked out, especially during holidays. To ensure that you are able to stay at The Corporate Beach House we suggest that you book as far in advance as you can. Functions, parties and large gatherings are not permitted. Any unnecessary disruptions and noise caused by guests to surrounding neighbours will not be tolerated. No smoking is permitted inside the house. All quotes are inclusive of other expenses such as agent booking fees and Paypal surcharges. The balance of payment is due 4 weeks prior to arrival. Full payment is required for any bookings made less than 4 weeks prior to arrival. Payment is paid directly to the owner via PAYPAL. Direct Debit may be available upon request. To secure your booking payment must be received within the specified time. For longer stays of more than 4 weeks. 25% deposit is required to the entire length of stay. To secure your booking payments must always remain at least 4 weeks in advance. Where the property is re-booked a refund will be issued less any expenses incurred. example: agent booking fees and Paypal surcharges. Where the property is partially re-booked a refund will be issued for the re-booked portion less any expenses incurred. No refund will be made if the property is not re-booked. The property is let for Short Term Accommodation purposes only. The number of guests permitted to stay overnight is at the discretion of the owner at the time of booking. The number of guests must be confirmed on arrival.